Nobel Prize-winning economist Joseph Stiglitz, one of America’s most prescient voices, wrote an article for Vanity Fair several months before Occupy Wall Street was born. “Of the 1%, by the 1%, for the 1%” called attention to the widening gap between rich and poor and its deadly impact on our society and its democratic institutions. In his newly released book, The Price of Inequality, Stiglitz returns to this theme of a divided society, delving into the origins and consequences of economic unfairness. I caught up with Professor Stiglitz and talked to him about how the persistent myths and beliefs associated with our capitalist system help to drive this trend, turning America from a land of opportunity to a land of broken dreams. Lynn Parramore: An argument has been made, particularly since the end of the Cold War, that capitalism is great at producing things that can improve our lives, and so we ought to therefore tolerate some unfairness. What’s wrong with that narrative? Joseph Stiglitz: Well, capitalism does have a lot of strengths, including producing things that are very innovative. 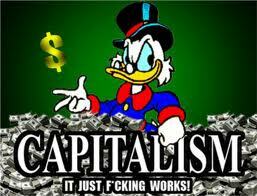 But what drives capitalism is the profit motive. You can profit not only by making good things, but also by exploiting people, by exploiting the environment, by doing things that are not so good. The narrative that you describe ignores the extent to which a lot of the inequalities in the United States are not the result of creative activity but of exploitive activity. And if you look at the people at the top, what is so striking is that the people who’ve made the most important creative contributions are not there. By that I mean the really foundational things like the computer, the transistor, the laser. And how many people at the top are people who made their money out of monopoly — exercising monopoly power? Like bankers who exploited through predatory lending practices and abusive credit card practices. Or CEOs who took advantage of deficiencies in corporate governance to get a larger share of the corporate revenues for themselves without any regard to the extent to which they have actually contributed to increasing the the sustainable well-being of the firm. LP: How does our current situation compare to other eras in terms of the differences between ordinary Americans and the richest among us? JS: Doing a precise comparison is difficult because we don’t have data sets that go back that far. But we do have data sets that go back more than 30 years and what is clear is that the share of the top 1 percent has almost tripled since 1980. So, this kind of inequality at the top has unambiguously gotten much, much, much worse. We also have data on the extent to which there’s been a hollowing out of the middle class. The data that recently came out from the Fed indicated that we’ve wiped out 20 years of increases and wealth for the middle American. LP: So for most of us, 20 years of economic progress just went up in smoke. But the super-rich are doing very well. What happened? JS: It’s the peculiar nature of the American economy, which is that’s it’s a very powerful machine that is working for a very few people, and has not been delivering for most Americans. If you had an economic machine that worked the way it was supposed to, everybody would be getting better. And an economy that’s normally growing, say, 3 percent, even over a 20-year period. Steady accumulation would lead to their wealth more than doubling in that period. And it clearly hasn’t happened. And adjusted for inflation, it would have even increased even before, unadjusted for inflation, would have increased it even more. And that clearly hasn’t happened. LP: There’s a persistent myth that America is still the “land of opportunity.” Why is that myth so prevalent, even in the face of so much evidence to the contrary? JS: Well, there are two reasons for this. One of them is that the myth is so much part of our sense of identity as Americans that it is devastating for us to give it up — for us to say we are less of a land of opportunity than old ossified Europe. It was one of the things we were most proud of, and clearly, it’s not true. When you have something that’s so inconsistent with your self image, it’s really, really hard to face the facts. The second reason has to do with the nature of evidence. Everybody know examples of people who make it from the bottom or the middle-bottom to the top. And our press talks about them. The media calls attention to the successes. But when they call attention to successes they don’t say this is one of a million or one of a thousand. In fact, the reason they write about it is because they are so unusual. If most people did it, it wouldn’t be an unusual story. So, in a sense that’s how our media works. It encourages us to think of the exceptions as the norm. LP: Some say that if we redistribute income in a more equitable way, people won’t want to work as hard. Is that true? What happens to our motivation to work when things are so inequitable? JS: One of the myths that I try to destroy is the myth that if we do anything about inequality it will weaken our economy. And that’s why the title of my book is The Price of Inequality. What I argue is that if we did attack these sources of inequality, we would actually have a stronger economy. We’re paying a high price for this inequality. Now, one of the mischaracterizations of those of us who want a more equal or fairer society, is that we’re in favor of total equality, and that would mean that there would be no incentives. That’s not the issue. The question is whether we could ameliorate some of the inequality — reduce some of the inequality by, for instance, curtailing monopoly power, curtailing predatory lending, curtailing abusive credit card practices, curtailing the abuses of CEO pay. All of those kinds of things, what I generically call “rent seeking,” are things that distort and destroy our economy. So in fact, part of the problem of low taxes at the top is that since so much of the income at the very top is a result of rent seeking, when we lower the taxes, we’re effectively lowering the taxes on rent seeking, and we’re encouraging rent-seeking activities. When we have special provisions for capital gains that allow speculations to be taxed at a lower rate than people who work for a living, we encourage speculation. So that if you look at the design bit of our tax structure, it does create incentives for doing the wrong thing. LP: When ordinary people see this speculation and unfairness, do you think it disincentivizes them to work harder, to take risks? JS: Oh, very much so. 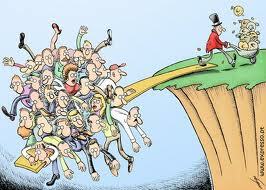 It has a very enervating effect on our society and our economy. I describe experimental results in in my book where peoples’ incentives to work hard are reduced when they believe they are part of an unfair system. LP: We also hear that deregulation and downsizing government is somehow supposed to make capitalism work better for all of us. Why has that persistent belief failed us? JS: A lot of these are questions about perception. To the extent that we can see waste, obviously we say that if we could get rid of that waste, we would be a better economy. By definition, waste is waste. The Republican rhetoric has focused on waste in the public sector. But waste, at some level, is an inherent consequence of human fallibility. We’re going to make mistakes, and that’s going to be true in the public and the private sector. No government program has ever wasted resources on the scale of America’s private financial sector in the run-up to the crisis. So the first thing you realize is there is waste everywhere including in the private sector. Now if you ask people about things there are important to them … obviously they care a lot about the school their children go to. They worry about too-large classes. They worry about police protection. Those are all things that people value a lot. They value the Internet, which was created by government-funded research. Health care and drugs were are all based on government-funded research. So the bottom line is that government services have proved highly valuable. And this is where the big lie, the big distortion is. By talking about the few instances of inefficiency, they try to direct the attention away from the teachers, the policeman, the fireman, the researchers, the people building the roads to make our society function. And they turn our attention away from the failures in the private sector. This entry was posted in Economics, economy, inequality, taxes, Wall Street and tagged AlterNet, capitalism, Joseph Stiglitz, Lynn Parramoe. Bookmark the permalink.